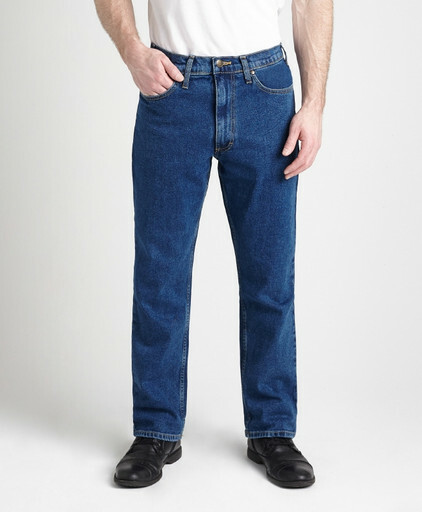 GRAND RIVE STRETCH JEANS. Some carry the RIVER ROAD Label. These jeans are Top Quality! The #180 is made from 12.5 oz., 98% Cotton/2% Spandex Denim that gives you S-T-R-E-T-C-H for an extra Comfortable Fit and Ease of Movement. Stonewashed so there is no need to break in these jeans. Nice wide and deep pockets. This is a 5-pocket favorite among men for a wide variety of uses, both work and leisure time: executives, office workers, long distance truck drivers, motorcycle riders, pilots, boaters, auto drivers, golfers and a favorite of retirees!